An adze, peculiar tool name, but I suppose the earth's inhabitants thousands of years ago, didn't talk much English. 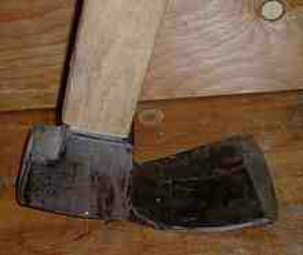 It is used for carving or smoothing rough cut wood. Used most often for squaring up logs or hollowing out. The implement has a similar chipping function to an axe, but is set at right angles to the shaft and the cut is made towards you instead of away. I always advise against this, so be careful you don't cut off more than you can chew. It's a wonder Health and Safety haven't banned the implement. The tool has been made from various materials throughout time. In the Mesolithic period, 10,000BC, they were made from knapping flint, stone, amphibolite, basalt or jadeite but by the Pre-dynastic age, copper had replaced stone. The head was originally tied to a wooden haft (shaft shortened ) but when moulding of metals originated, a hole for the haft was created. The haft is traditionally made from a crooked branch forming an approximate angle of 60 degrees, the thinner end used as the handle, the thicker inserted into the crook ( hole ) of the head. In new designs the haft is a lesser angle than the original. Cutting edge shapes vary from flat to concave, even to 'U' shaped. Ideal for chair seat recessing, bowl carving and general scolloping is the Ox-Head Curved Gutter Adze which is priced at $126.70 and manufactured by Ox-Head. Replacement handles made of hickory or ash are $ 24 for a 36" and $ 4 for a 14"